For the second time in a matter of months, a construction worker was injured after falling at the site of an under-construction Facebook building in Menlo Park, according to the Menlo Park Fire Protection District. Bob Redell reports. For the second time in a matter of months, a construction worker was injured after falling at the site of an under-construction Facebook building in Menlo Park, according to the Menlo Park Fire Protection District. The latest incident occurred Tuesday morning when a worker, who was wearing his safety harness and rigging, fell 10 to 15 feet from the steel framing on the building's fourth floor, according to fire officials. 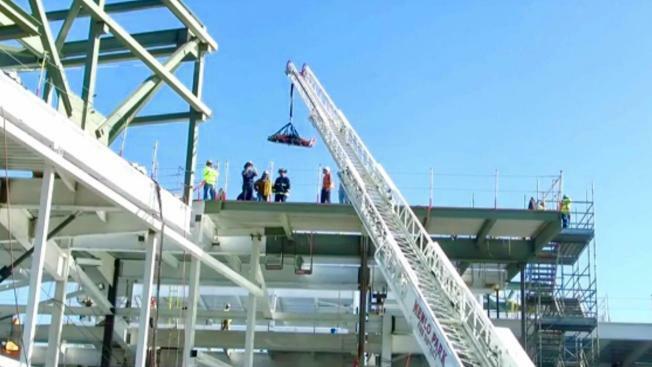 "Fortunately, the steel worker was wearing his safety harnesses and rigging, which probably helped to prevent significant injury or even death," Menlo Park Fire Protection District Chief Harold Schapelhouman said in a statement. The worker experienced significant pain and suffered both bruises and cuts, fire officials said. He was transported to a nearby hospital. The worker was walking along a piece of decking or steel when it was dislodged, sending the worker plummeting toward the third flood, according to fire officials. The worker's safety gear managed to catch him just before slamming into the floor. Using a 107-foot-long aerial ladder, firefighters managed to lower the worker to the ground where an ambulance was waiting, according to fire officials. Back in April, two other workers were injured at the same building after falling about 20 feet. Those workers were also wearing safety equipment that stopped them before they could actually hit the ground. "This is the second time we’ve been out here in the last three months for injured steel workers falling from the building," Schapelhouman said in a statement. "That’s not only very unusual, but it deeply concerns me."